Cyblade and Elektra, Mephistos prisoners, now find themselves outside the Las Vegas of Top Cows dimension. They enter the city, which is overrun with demons and humans who behave even more decadently than is typical. Presiding over it all is Mephistos lieutenant, the mind-controlled Heatwave, Cyblades missing teammate, but now known as the Fire King.<br />Meanwhile, in Los Angeles, the brainwashed Jamie Tarleton, a.k.a. Fist of Weapon Zero, gathers followers for Mephisto, egged on by Erisha.<br />In Vegas, Cyblade and Elektra make their way to the nightmarish Citadel Hotel and Casino. They sneak in, and fight against demonic guards, until they reach the floor where the Fire King resides. 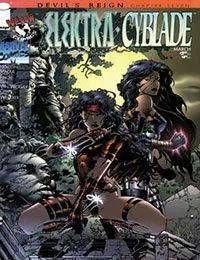 Drawing her sword, Elektra leaps to strike Heatwave, but Cyblade blasts her. The Fire King cages Elektra within bars of fire, as she exhorts Cyblade to kill her teammate for the sake of two universes. Instead, she tries to appeal to Heatwave, and he responds by knocking her out.<br />When she comes to, he forces her to watch as the hedonistic crowd below are consumed by hellfire. Elsewhere, Mephisto watches with glee.